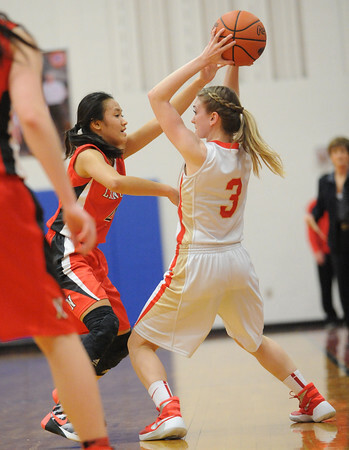 Bishop McCort’s Machala Gibbons,right, is pressured by Neshannock’s Stephanie Paras during a PIAA class AA first-round state playoff game at Richland High School in Johnstown,PA., Fri., Mar.4, 2016. Bishop McCort won 55-29. (Tribune-Democrat, John Rucosky).